If the trigonometric functions are in degrees, tap RAD to switch the calculator to DEG (degrees mode). All functions will be interpreted in degrees. 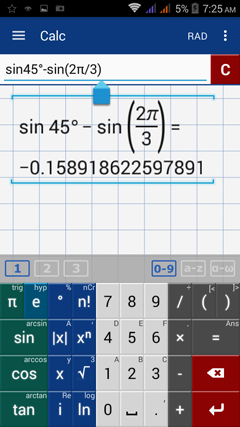 To use trigonometric functions in radians, tap DEG to switch back to RAD (radians mode). Functions will be interpreted in radians. To use degrees, add a degree symbol after arguments. The sine key calculates the sine value of a given angle expressed in radians by default. Tap the º (degree) key to enter an argument in degrees. Note: Make sure to add parentheses around the radian measure 2π/3. Tap the sine key twice to use arcsine. It is used to find the measure of an angle given the value of its sine. If sin A = 0.707, what is the value of A? 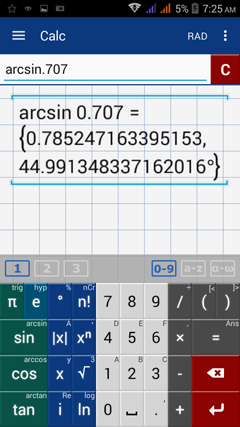 To solve for A, take the arcsine of 0.707. Double tap the sine key, then type 0.707. 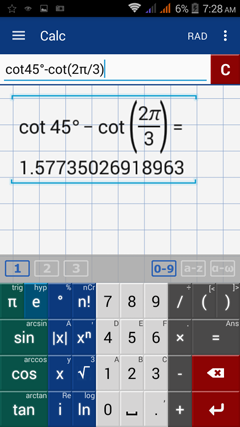 Tap the sine key three times to use the cosecant function. The cosine key calculates the cosine of a given angle expressed in radians by default. To use degrees, tap the º (degree) key after the argument. Tap the cosine key twice to use arccosine. It is used to find the measure of an angle given its cosine. If cos A = 0.707, what is the value of A? To solve for A, take the arccosine of 0.707. Tap the cosine key twice, then type 0.707. Tap the sine key three times to use secant. The tangent key calculates the tangent of a given angle in radians by default. Tap the º (degree) key to use degrees. Tap the tangent key twice to use arctangent. It is used to find the measure of an angle given the value of its tangent. If tan A = 0.707, what is the value of A? To solve, find the arctangent of 0.707. Tap the tan key twice, then type 0.707. Tap the tan key three times to find the cotangent. Type cotangentby tapping tan three times.